Let me summarize what I want to say in one brief statement: We are sinners yet called to follow Jesus. I have three points that correspond to all the readings today including the readings from the breviary’s Morning Prayer. First, we are sinners. 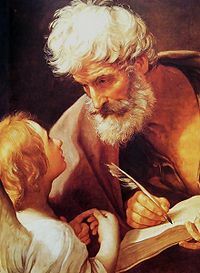 St. Matthew, whose feast we celebrate today, is a sinner. During his time, tax collectors were considered heartless towards their fellow Jews. He was pro-government, thus a supporter of Rome. He collected taxes and we could also imagine how much he got from it. Our present-day experience of our taxes going to some other pockets have been existing generations ago. In those days, tax collectors were suspect to many pious Jews on the grounds of their collaboration with Roman officials and their practice of extorting more than what was owed to the government. And thus, dining with tax collectors and sinners scandalized many Pharisees for whom ritual purity and table fellowship were important religious practices. But the gesture of Jesus paved the way for acceptance of all kinds of people into the Church. How? The letter of St. Paul to the Ephesians states that God endowed us with distinct gifts. He gave some as “apostles, others as prophets, as evangelists, others as pastors and teachers, to equip the holy ones for the work of ministry.” This means that we will be able to know our roles in building the community of God from the gifts and abilities that we have. By discovering our place in the whole vineyard of God, we will also encounter the uniqueness and distinction of our identity. There is always a place and a distinct work for each person. Thus, we are not to compete, but we are to complement each other, build each other up, until we are able to come to the full stature of Christ. And so just as St. Matthew’s past was dark and sinful, the last say in our lives is not our sinfulness, but how we respond to God’s call to follow him. The best thing is this: God does not ask us to do what is beyond our capacities. On the contrary, we are invited by God just to look into our own treasure chest and discover that we have more than what it takes to contribute to the task of evangelization and rebuilding communities. Matthew worked ‘outside of the Jewish circle’ as a tax collector. But he ended up serving a “Christian-Jewish community.” The change is remarkable. And so is the One who made it possible. Previous How to Hit it Big! Next Do You Feel Pressured to Mature Ahead of Your Time?